While pregnant with her second child, Erin Martucci decided early on against having an epidural to help manage the pain. But during labour, as her contractions progressed and became increasingly unbearable, she started to reconsider her decision. When Martucci told her doctor she might need an epidural after all, he offered her an alternative opportunity for pain relief that didn't involve any drugs. Instead of an injection, she would don a virtual reality headset programmed with soothing nature scenes and narration. She accepted the experimental therapy and found herself transported to a beach as a woman's voice gently told her to breathe. "I used the apparatus for probably about two hours, but I felt like it was only like a half hour. During that time, my doctor came over to take the apparatus off me, and he's like, 'You're ready! You're going to push your baby out!'" said Martucci. "And within less than a minute, I delivered my baby." In November 2016, she gave birth to a healthy baby girl at Orange Regional Medical Center in Middletown, New York, becoming the first woman known to use VR for pain management during labour. She spoke about her experience at the recent Virtual Medicine conference held at Cedars-Sinai Medical Center in Los Angeles, one of the pioneering hospitals leveraging VR for clinical purposes. The conference brought together physicians, patients and VR developers to discuss the current state of medical applications for this budding medium. "Over 2,500 patients here [at Cedars-Sinai] have received one or more forms of virtual reality as part of a therapeutic intervention," said Brennan Spiegel, director of Cedars-Sinai Health Services Research. "It's been an incredible journey over the last three years." Spiegel, who served as course director for Virtual Medicine, has been experimenting with VR as a form of medication-free relief for acute or chronic pain, which is perhaps the technology's most promising application in medicine. With the opioid crisis in full swing nationwide, physicians are desperately seeking safe, effective, and non-addictive options for patients. "The statistics [of the opioid crisis] are beyond comprehension. If a 747 were to crash and burn every five days, that would be the number of people that die per year of opioid overdose in the United States," said Spiegel. "We need to think about alternatives to opioids for pain management." He recently published a study with his colleagues that compared the impact on pain of a 3D immersive VR game versus a 2D high-definition video depicting relaxing nature scenes in hospitalised patients. 50 patients played Pain RelieVR on a Samsung Gear VR headset, a game specifically designed to treat pain in patients who are bed-bound or have limited mobility, while another 50 watched the 2D video. The game is made by Los Angeles-based AppliedVR, who has developed over 30 immersive experiences for patients, including the one Martucci used during labour. The patients rated their pain before and after using a standard 11-point numeric rating scale, ranging from 0 (no pain) to 10 ("the worst pain of your life"). While both groups saw a significant drop in pain, patients who used VR showed a larger decrease when comparing their ratings before and after playing Pain RelieVR. Also, more patients successfully responded to VR — as in, a given individual felt less pain afterwards — versus the 2D video. "For every four people who received VR, there's one person who had a pain improvement that was clinically meaningful," said Spiegel. "That's not too different — in fact, in some cases, is lower — than what we see with opioids." The researchers have a large randomised controlled trial in progress where they keep a VR headset at the bedside throughout the patient's hospital stay. While they've been seeing similarly good results, Spiegel emphasises that the idea behind VR therapy for pain isn't to stay immersed in the headset for hours upon hours. He hopes that, especially for those with chronic pain, the technology can help patients learn pain management skills like breathing exercises, meditation, and visualisation. Another patient who spoke at Virtual Medicine, 34-year-old Harmon Clarke, described how VR helps manage his pain even when he's not wearing a headset. He was diagnosed with Crohn's disease at the age of 16 and has had over 30 surgeries since. Although he initially felt skeptical about the technology, he gave it a try during one of the hospital procedures he hates the most: getting an intravenous (IV) line placed. At one point, eight different nurses came into his room trying to insert an IV while Clarke was in tears from the pain. "I have my VR set next to my bed, and thought I may as well try it since that's what it's here for. So I throw the VR set on, and it takes me to Yellowstone National Park," said Clarke. "I remember being immersed in this world while the nurse was there, and the next thing I know, she taps my arm and says she's done. And I'm like, 'Are you serious?'" Since that day, he's used VR frequently both in and out of the hospital, calling it "a game changer" for him. Clarke had been using applications that teach him breathing techniques, mindfulness, and other relaxation tools that he can call on outside of a virtual environment. 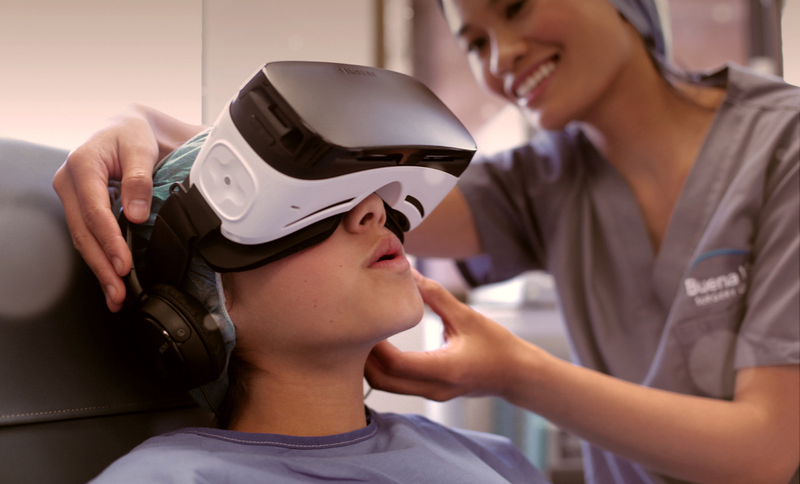 Despite a growing number of patient and physician cheerleaders for the technology, many challenges still remain before VR therapy for pain will become widespread. Spiegel mentioned how some patients react with fear or anxiety while using VR, depending on the content and the individual's history. Also, a large portion of people medically eligible for the VR intervention — particularly older patients — were unwilling to even try it. Lastly, the lack of large randomised clinical trials and rigorous comparisons against traditional pain medications mean questions still exist about VR's efficacy. But as more patients spread the word about their positive experiences with VR to others, its adoption rates have a good chance of increasing. For Martucci, the technology not only helped relieve her pain in the moment, but the lack of anaesthesia drugs helped her to immediately bond with her new baby. "When I delivered her, immediately I was able to connect with her, and I also breastfed immediately," said Martucci. "So I had a very successful experience using VR while delivering my baby. If I get pregnant again, I'll use it again."